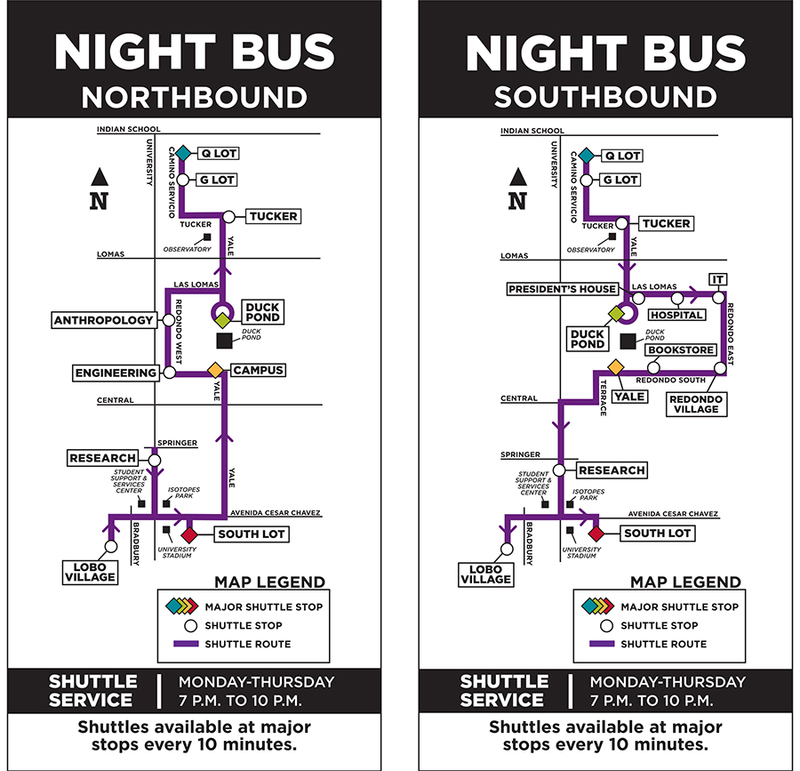 The Night Bus route, available in the Fall and Spring Semesters, was designed to provide easier, more efficient connections between north, south and main campus while providing late-night service hours. For increased efficiency, the Night Bus combines the South Lot, Lobo Village/SSSC, G/Q, and Redondo routes into one timed route. Shuttle service will be available at major stops: Q Lot, Duck Pond North, Duck Pond South, Yale, Campus, and South Lot every 10 minutes from 7 p.m. to 10 p.m., Monday through Thursday. Service at “in-between stops” of the previously mentioned major stops will not be timed. Track the Night Bus, in real-time, on the Where’s My Bus App. Download a PDF version of the Night Bus Shuttle Route. Night Bus Service Hours: Available in the Fall and Spring semesters, Monday thought Thursday: 7 p.m. – 10 p.m.
Shuttles available at major stops every 10 minutes. Major stops on each route are indicated by red circles in the carts below. Monday through Thursday 7 p.m. to 10 p.m.
Shuttles available every 10 minutes at major stops.